ct the interests of British bosses. Although this was a case, attitude of Indian legislators, as it turned towards being independent from the clutches of British empire, has been very constructive and pro-welfare state. The importance of the minimum wages as an instrument of social protection was already high lightened in the ILO constitution adopted in the year 1919 as a part of treaty of Versailles after the end of World War 1. The preamble of this constitution recalls, “the High Contracting parties, moved by sentiments of justice and humanity as well as by the desire to secure permanent peace has called for the provision of an adequate living wage alongside other measures to improve the condition of labour. The concept of minimum wages first evolved with reference to remuneration of workers in those industries where the level of wages was substantially low as compared to the wages for similar types of labour in other industries. First of all, at the International Labour Conference in 1928, a Draft Convention was adopted on the subject of minimum wages. In India in 1929 Royal Commission on Labour was adopted which considered the subject of minimum wages. “If the labourers are to be secured the enjoyment of minimum wages and they are to be protected against exploitation by their employers, it is absolutely necessary that restraint should be imposed upon their freedom of contract and such restrictions cannot be in any sense be said to be unreasonable. On the other hand, the employers cannot be heard to complain if they are compelled to pay minimum wages to their labourers even though the labourers on account of their poverty and helplessness are willing to work on lesser wages”. The question of establishing statutory wage fixing machinery in India was first discussed in 1929 by the Royal Commission on Labour which was appointed and this commission considered the subject of minimum wages. The question of establishing statutory wage fixing machinery in India was again discussed at the third and fourth meetings of the Standing Labour Committee held in May 1943 and January 1944 respectively, and at successive sessions of the tripartite labour conference in September 1943, October 1944, and November 1945. The last of these, approved in principle, the enactment of the minimum wages legislation. On 11 April 1946, a minimum wages Bill, was introduced, but the passage of bill was considerably delayed by the constitutional changes in India. It reached the statute book only in March 1948. The purpose of seeking employment is to sell labour to earn wages so as to attain a ‘decent’ or ‘dignified’ standard of living. The wage or income that a worker obtains from his/her work is therefore, what enables him/her to achieve a fair standard of living. One seeks a fair wage both to fulfill one’s basic needs and to feel reassured that one receives a fair portion of the wealth in return for one’s work to generate for the society. Society has a duty to ensure a fair wage for every worker, to ward off starvation and poverty, to promote the growth of human resource, to ensure social justice without which likely threats to law and order may undermine economic progress. If ‘labour’ is to be defined, which is the central issue in focus, for which an amount is fixed; labour is defined by prominent persons such as:- S.E.Thomas , who says that , “Labour consists of all human effort of the body or of mind, which is undertaken in the expectation of reward”. Mr.Jevons states that,” Labour is any exertion of mind or of body or both, undertaken partly or wholly with a view to some good than the pleasure derived directly from work”. Thus, labour in broad sense of the term may be defined as any hand or brain work which is undertaken for a monetary consideration. (i) In a free competitive market, the level of wages payable to workers is determined by the forces of demand and supply. In a welfare state the protection of the interests of the workers is one of the aims of legislation which is enacted in the labour field. The same is true with regard to the Minimum Wages Act enacted by the Indian parliament. (ii) The Indian labour class besides being illiterate is by an large not organized to protect its interests in a competitive market where supply of labour is always excess of demand. Under such conditions the labour class is left to itself and is unable to protect its legitimate interests. In a country which is still underdeveloped, the exploitation of labour in certain industries can become a common feature due to reasons that unemployment and few avenues for gainful employment which forces the labourers to accept the employment even on starvation wages. Therefore, the Act was enacted to secure the welfare of workers in a competitive market by providing for a minimum limit of wages in certain employments. (iii) The object of this Act is to “prevent exploitation of the workers” and for this purpose, it aims at fixation of minimum wages which the employer must pay. What the act purports to achieve is to prevent exploitation of labour and for that purpose, authorises appropriate government to take steps to prescribe minimum rates of wages in Scheduled industries. What is being prescribed is minimum rates of wages which a welfare state assumes every employer should pay before employment of any labourer. It is only with regard to certain specified industries that the provisions for the payment of statutory minimum wages have been laid down. The legislature undoubtedly intended to apply the Act to those industries or localities, in which, by reason of causes such as unorganized labour or absence of machinery for the regulation of wages which are paid to workers, were in the light of the general level of wages and they were subsistence inadequate. The provisions of the Act were intended to achieve the object of doing social justice of workers employed in the scheduled employment by prescribing minimum rates of wages to them. (iv) As pronounced in judgement of the case of , ‘Hydro(Engineers) P. Ltd /vs/ Workmen. AIR 1969 SC182. “The Act contemplates that minimum wage rates must ensure not the mere physical need of the worker which would keep the worker just above starvation but ensure for the worker not only subsistence and that of his family but to preserve the worker’s efficiency as of a workman. It should, therefore, provide not merely the bare subsistence of life but the preservation of workers’ health and for some measure of education, medical requirements and amenities”. (v) In the case of “Edward Mills co .Ltd, Beawer /Vs/ State of Ajmer(1954) II L.L.J 686, it is decided that the object of the Minimum wages Act as, “ The object of this Act is to prevent exploitation of the workers and for this purpose, it aims at fixation of minimum wages which the employer must pay”. (vi) In the case of, “ M/S Bhikua Yamasa Kshatriaya /Vs/ Sangamner Akola taluka beedi Kamgar Union , AIR 1963, S.C. 806, it was decided that , “The legislature undoubtedly intended to apply the Act to those industries or localities in which, by reason of causes such as unorganized labour or absence of machinery for regulation of wages, the wages paid to workers were in light of general level of wages and subsistence level inadequate”. Like other branches of labour legislation, the security of industrial peace and efficiency may be kept in view when giving effect to the provisions of this Act. In the view of the fulfilment of the purpose of welfare state, it was upheld in the case of ‘ Patel Ishwarbhai Prahladbhai /vs/ Taluka Development Officer (1983) I Lab 7C 237 S.C. , that , “ Every person who provides labour or service to another is entitled at least to a minimum wages.”. (vii) The judgement in the case of “ Crown Aluminium Works /vs/ Their workmen AIR 1958 SC 30” , states the motivation of the legislature for enactment of the minimum wages Act, 1948, in the following words, “ In developing country like ours which faces the problem of unemployment on a very large scale, it is not unlikely that labour may offer to work even on starvation wages. 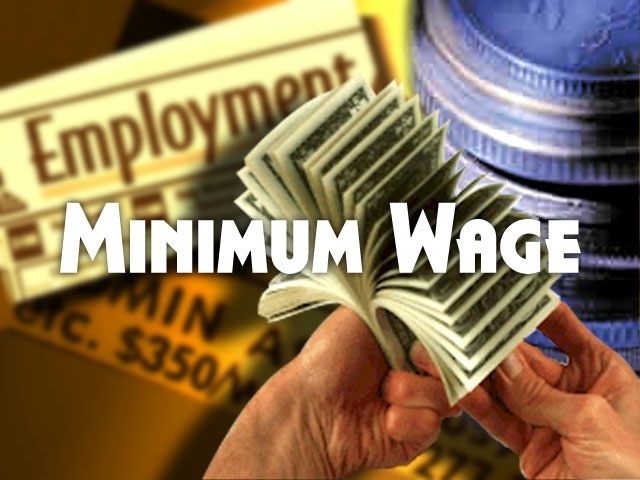 The policy of the Act, therefore, is to prevent employment of sweated labour in general interest and , so in prescribing the minimum wage rates, the capacity of the employer need not be considered as the state assumes that every employer must pay minimum wages for the employee’s labour”. Therefore, the entire scheme of the Act is a pointer towards the direction of ensuring minimum wages to workers engaged in certain specific industries.